A beautiful realistic tulip flower with a clever one-piece construction – you’ll love how it comes together! Add some colour to your life with a bouquet of everlasting tulips. I used worsted weight yarn and a size E hook, which produced a lifelike 2.25″ (6cm) tall flower. (Your gauge and yarn choice will affect the finished size slightly.) Try using a finer yarn or crochet thread with a correspondingly smaller hook to give a more compact flower. Tips 1 and 2 only: Fasten off, leaving a short yarn end. Tip 3 only: Do not fasten off. Continue to Petal Joining. Rnd 6: sc in next 5 st (placing a stitch marker in the first stitch worked); move to the next unworked st of Tip 1 (marked by arrow in photo, below, left) and sc in that st and in next 4 st; move to the next unworked st of Tip 2 and sc in that st and in next 4 st. (15 st). Note: The three tips are now all joined together in a line (below, right). Pull the yarn ends from the colour change through to the inside. Don’t worry that your flower now looks very strange – this is correct! The previous section formed the inside of the tulip, and now you’ll turn it all inside out so you can work the remainder of the outside of the tulip flower. Grasp the tulip by the yellow centre (below, left), and begin to push it down into the flower (below, centre), to turn the flower inside out. Note: The yellow centre will not be turned, so you can use it as a handle to push with. Continue to push it all the way through until the petals are at the top of the flower, and the yellow centre is inside at the bottom (below, right). Turn the flower upside down. With A, fasten on at the last stitch worked on one of the petal tips (the stitch before one of the short yarn ends from the petal tips – marked by arrow, below, left), ch 1. Tuck any remaining loose yarn ends down inside one of the petal tips to keep them out of the way. Join with sl st and fasten off, leaving a long yarn end. Optional: Make a couple of stitches around the bottom of the flower, passing through both layers, to attach the inner and outer layers together and stop the inside from being pulled out. Weave in the remaining yarn end. I used yarn-covered 1/8″ wooden dowel to make my tulip stems. If you prefer, you may omit the stem altogether, or wrap yarn around, or crochet over, a bamboo skewer, floral wire or pipe cleaners to make a stem (see my Basic Rose pattern for details). For detailed instructions for making stems, see my Easy Yarn-Wrapped Stems for Crochet Flowers video tutorial, or follow the basic instructions below. With the end of the yarn, leave a short yarn tail and tie a single knot tightly around the stem base, about 2cm (3/4″) from the top (below, left). Lay the short yarn tail against the stem, pointing down, and begin to wrap the yarn around both the stem and the yarn tail (below, right). Continue wrapping the yarn all the way to the bottom of the stem. Once the yarn is well-anchored to the stem, and the tail is covered, you may find it faster to rotate the stem so the yarn is wrapped onto it, pausing to push the turns of yarn together if you notice any gaps between them. 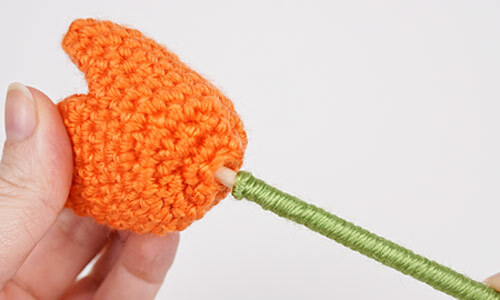 Knot the yarn around the bottom end of the stem, and secure the knot in place with glue before cutting the yarn. Flatten the three petal tips of the tulip, then push the tips together (below, left). Open the tips slightly so they point straight upwards (below, centre) and you can see the yellow centre if you look down from the top of the flower (below, right). Insert the uncovered tip of the stem through the hole in the bottom of the tulip, so it goes up inside the middle of the yellow centre of the flower. Optional: To keep the flower head from being pulled off, you can pull the stem out most of the way again, apply some white glue to the top of the stem, push it back into the flower, and hold it in place for a minute until the glue dries.